STIMULATES SENSES & SKILLS OF YOUR CAT, IS FUN, ENTERTAINS AND REFRESHES. You can use any large container for food use (decorative fountains contain lead, which is toxic). We opted for a glass bowl for visibility and which, full of water, is quite stable. Although for some cats perhaps a wider base will be better. We choose EVA rubber balls because their texture allows them to be grasped with nails and mouths (in fact Phibï most of the times takes them out with his (he has a tendency to 'retrieve' things) and we made sure they aren't toxic (quality EVA rubber is not, but it doesn't hurt to have a little extra care and to do, like a cat, an olfactory test. If at opening the package or the little ball itself smells (like chemical), better discard it. 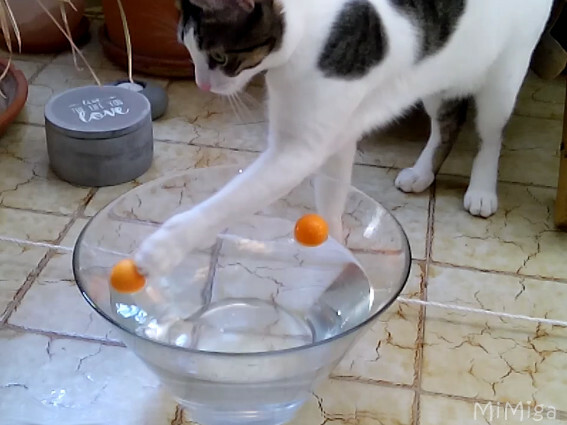 We have implemented our summer cat ball pool ... adding an irresistible element ... TREATS! And our Phibï has become an expert in strategic fishing, using -for the moment- 3 different techniques as the situations require. We use lyophilized / freeze-dried snacks (in this case, the Cosma from Zooplus) because my cats love it and because it's the most hygienic option: As it's pieces of dehydrated chicken (or what your cat prefers), nothing happens when they fall into the water. If your cat tarries in fishing them out, they swell up, but they don't fall apart and make a mess in the water. And they are a natural, healthy treats. We wish you all a #HappyFelineSummer.